What Is Your Favorite Gold Jewelry Hunting Machine? I thought you might be interested in looking at What Is Your Favorite Gold Jewelry Hunting Machine?. Which metal detectors have the most reliable target ID numbers? Target ID is a function of depth - the deeper the target, the more difficult it is to get a clean target ID as the ground signal interferes. Other items directly adjacent to the desired target can also cause inaccurate numbers. The more conductive the item, the higher the resulting ID number, but also the larger the item the higher the number. Silver is more conductive than gold, so a gold item will give a lower number than the same size silver item. But a very large gold item can give a higher number than a small silver item, so numbers do not identify types of metal. Gold and aluminum read the same and vary in size so to dig one you dig the other. Only mass produced items like coins produce numbers that are more or less the same over the years but a zinc penny will read lower than a copper penny due to the change in composition. In general iron or ferrous targets produce negative numbers or low numbers. Aluminum, gold, and US nickels produce mid-range numbers. And most other US coins produce high numbers. Other countries coins, like Canadian coins with ferrous content, can read all over the place. The scale applied varies according to manufacturer so the number produced by each detector will vary according to the scale used. The 0-100 range for non-ferrous targets is most common but there are others. 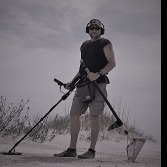 Minelab employs a dual number system on a 2D scale with thousands of possible numbers, but they are now normalizing the results produced to conform more closely to the linear scale used by other manufacturers. Increasing ground mineralization has a huge effect on the ability to get a good target ID. Ground mineralization is nearly always from iron mineralization, and this tends to make weak targets, whether very small targets or very deep targets, misidentify. The target numbers get dragged lower, and many non-ferrous targets will eventually be identified as iron if buried deep enough. Small non-ferrous readings and iron readings actually overlap. That is why any discrimination at all is particularly risky for gold nugget hunters. If you want target ID numbers to settle down, lower sensitivity and practice consistent coil control. The target number will often vary depending on how well the target is centered and how fast the coil moves. Higher sensitivity settings lead to jumpier numbers as the detectors become less stable at higher levels. The interference from the ground signal increases and interference from outside electrical sources also increases, leading to less stable numbers. Higher frequency detectors are inherently more sensitive and are jumpier. So lean lower frequency for more solid results. Multi frequency detectors act like low frequency detectors and tend to have more solid target numbers due to the ability to analyze a target with different frequencies. Another issue is the number of target categories, or ID segments, or VDIs, or notches, or bins (all names for the same thing) that a detector offers. Fewer target categories means more possible items get lumped together under a single reading, but that the reading is more stable. Many detectors will tell you the difference between a dime and a quarter. The Fisher CZ assumes you want to dig both so puts them under one segment along with most other coins. People who use detectors with many target numbers usually just watch the numbers jump around and mentally average the results. Some high end detectors can actually do this averaging for you! But I think there is something to be said for owning a detector that simplifies things and offers less possible numbers to start with. The old Fisher CZ method still appeals to me, especially for coin detecting. So do detectors like the Garrett Ace 250 or Minelab X-Terra 505 for the same reason. The problem is that as people strive to dig deeper targets or smaller targets the numbers will always get less reliable. But if you want to have a quiet performing metal detecting with solid, reliable target numbers look more for coin type detectors running at lower frequencies under 10 kHz or at multiple frequencies and possibly consider getting a detector with fewer possible target segments. And with any detector no matter what just back that sensitivity setting off and you will get more reliable target numbers. Detectors often use tones to identify targets and often use far fewer tones than indicated by the possible visual target id numbers. The X-Terra 705 for instance can use 28 tones, one for each segment. However, most people find this too busy, and so simple tone schemes of two, three, or four tones may be selected. I think it is instructive that many people often end up ignoring screen readings and hunting by ear, using just a few tones. This ends up just being an ultra basic target id system much like the simpler units offer. Reality is that most people do not need or care about huge numbers of target numbers. 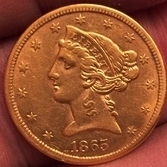 For many just three ranges suffice, low tone for iron, mid tone for most gold items, and high tone for most US coins. The meter could do the same thing, but for marketing purposes more is better and so we get sold on detectors with hundreds of possible target ID numbers. Perhaps this is a digital representation of an old analog meter with its nearly infinite range of response but the reality is we do not need that level of differentiation to make a simple dig or no dig decision. Finally, a picture often says it all. Below we have a shot of the White's M6 meter. I like it because the decal below illustrates a lot. You see the possible numerical range of -95 to 95 laid out in the middle. Over it is the simplified iron/gold/silver range. Note the slants where they overlap to indicate the readings really do overlap. Then you get the probable target icons. -95 is noted as "hot rock" because many do read there. Note that the screen reading of +14 is noted as being a nickel or ring but it can also be the "beaver tail" part of an aluminum pull tab or the aluminum ring that holds an eraser on a pencil, among other things. The best book ever written on the subject of discrimination is "Taking A Closer Look At Metal Detector Discrimination" by Robert C. Brockett. It is out of print but if you find a copy grab it, assuming the topic interests you. Always remember - when in doubt, dig it out! Your eyes are the best target ID method available. This will be where I will post information. I will try and answer any questions I can about detector. Other folks who have experience with detector and wish to join in, by all means do so. Should have detector today sometime. Thought I would get this thread started to save time later. I will only be using Tarsacci on turf, not salt water/sand application. I may do some testing on freshwater beach due to lower minerals present.